Katherine Lesh has a genuine history in farming. Her father, Tom Shepherd, was one of the pioneers of organic farming in Carpinteria. We are inspired by Katherine - Katie as we like to call her - because of her serious work ethic, amazing sense of humor, and nonchalant, intuitive mothering style. Six years ago she started her business with her husband Jason, where they harvested and sold her father's produce in the sweetest little wooden farm cart you ever did see, right in the heart of town. The business evolved to include farming their own plot of land, which proved to be too challenging to be sustainable (squirrels, drought, deer, anyone?). 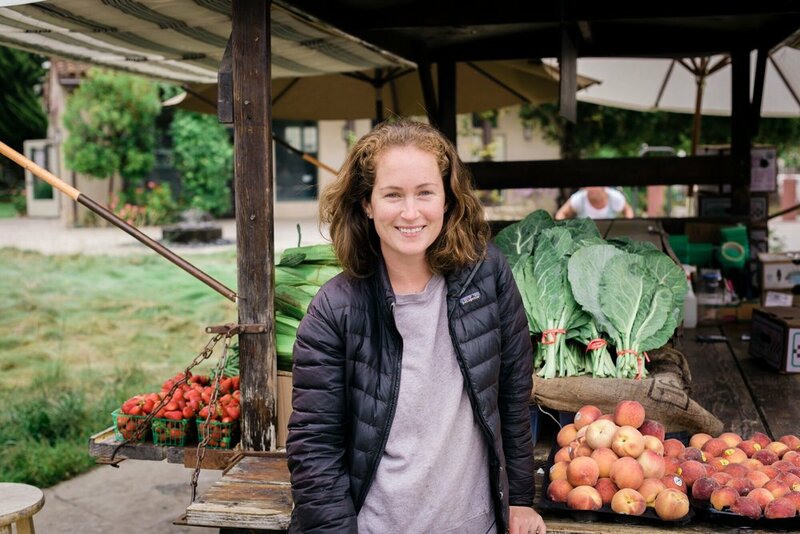 Luckily, Katie is resourceful and further evolved the business, reaching out to other organic farmers in the area, forming relationships with them, and selling their produce at her cart. We think that's what it's all about - community! When we collaborate with like-minded folks around us, that's when the magic happens. The Farm Cart is now a fixture in town, well known as the very best place to buy your organic fruits and veggies, year 'round. Hi I’m Katherine Lesh. My husband & I started The Farm Cart in 2012 where we sell organic produce to our community. Originally when we opened we only sold produce from my dad, Tom Shepherd’s farm. But when he quickly had to move farms we started our own farm and now we source our produce from organic farms all over Santa Barbara and Ventura county. We have a farm box delivery service where we pack the best items in the peak of their season and bring the boxes to peoples’s homes and drop points all over the area. You can sign up at farmcartorganics.com. We currently have a one acre garden located at Pacifica University and grow lots of row veggies, herbs, fruits and have 75 chickens. In a food processor, combine the kale leaves, basil leaves and salt. Pulse 10-12 times, until the kale leaves are finely chopped. With the motor running drizzle in the olive oil & lemon juice. Scrape down the sides of the processor. Toss with your favorite pasta or grilled chicken/fish and serve immediately.